Where: Theodore Naish Scout Reservation, Camp Naish Rd, Kansas City, KS 66111 (click for Google directions). North Meadows 3 campground Friday night. Download the Map of the 2019 Rim Rock Trail Hike. 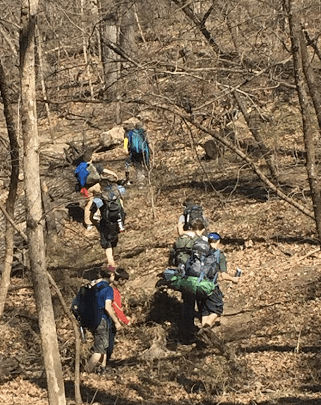 The goal of this trip is to learn and practice backpacking skills on a weekend trip that’s accessible to scouts and scouters of all ages and experience levels. There is no need to buy a lot of backpacking specific gear. Use what you have. It’s fun to be creative with gear and you can always portage what’s too heavy or bulky to carry. We also have several backpacks and other gear available on loan. Depart Scout Garage 5:30 pm and arrive at Base Camp at Naish by 6:15pm. Base Camp is in the North Meadows Camp 3 near maintenance shed where you can park. Please eat before 5:30 or bring dinner with you. Cracker barrel will be provided. Saturday morning, experienced guides will do a gear shakedown. We will collect items that will not be carried and portage to Saturday’s camp. Each scout should bring a bag to store portaged gear that can sit outside all day, rain or shine. Saturday we’ll have a backpackers breakfast in patrols and break camp at 8:30am. We will hike a total of 8 miles to reach the next night’s campsite. We will have lunch on the trail. We should arrive at our backcountry campsite (McDonald) around 3:00pm. Saturday evening we’ll have backpacking dinner in patrols and campfire. Patrols should plan skits and songs to perform! Sunday morning we’ll break camp after breakfast and hike four miles to the cars at the Base Camp. First year scouts (or older scouts with a small daypack) should only carry water, snacks, lunch (organized by patrols), additional warm layers (plus hat and gloves if needed) and rain gear. The weather will determine your exact kit. Toilet paper and hand sanitizer might be in order, as well as other items they might need for a full day spent outdoors. Total weight should be less than 10 lbs. Second year and older scouts have the option to carry more if they have a pack that can accommodate more weight. A daypack with a padded hip belt or multi-day pack. If you’re using a daypack, you should not carry more than 15 lbs and you should portage shared food and tents. Third year and older scouts should carry everything - house, bed and kitchen sink - on their backs! For older scouts this should a chance to practice your skills as if this were a 2 night wilderness backpacking adventure. See gear guidelines below for scouts carrying the full kit. It’s Spring so bring rain gear (or Snow Gear!!). A waterproof shell is best when it’s cool. Rain pants would be nice too but certainly not required for this weekend trip. Ponchos are ok but can be cool, especially if it’s windy. A sleeping bag or system (bag with liner) with a temperature rating of at least 30 degrees unless temperatures drop below freezing. If your sleeping bag is warm enough, but heavy and bulky (designed for car camping), you can always portage it to the campsite. No water filter will be needed. There will plenty of refill opportunities. For scouts to carry full gear they’ll need a pack with padded hip belt capable of carrying 25-30 pounds. We have plenty of packs available on loan. Please ask if you’re unsure about your pack. Comfortable walking shoes or hiking boots required. If you’re wearing sneakers, make sure they are running shoes or trail runners with a sturdy tread. No basketball or court shoes because you won’t get far if it’s muddy. Scouts will cook in patrols on backpacking stoves supplied by the troop. Philmont crews will have additional gear and skill requirements that we’ll discuss in crew meetings. We are trying an online registration form get a count early for scouts and adults attending, so please fill out the form below. You'll still need to print and sign a permission slip as well. If you have questions, contact Scott Shorter ([email protected], 816.674.6674). Read Troop 118 Backpacking Guide for tips on what to bring and how to pack. You'll also find all the checklists, Philmont-specific requirements and other useful links. Scouts participating promise to obey the Scout Oath and Law, and Be Prepared. We encourage all parents to get involved! It improves the experience for scouts and makes it easier to plan and manage events. BSA requires that adults participating in official troop events be registered and have completed the BSA Youth Protection Program.